Our vision is to reach every sick child, everywhere. We know that's not really possible, but with your involvement we can help make the sick children in your local hospital smile a lot more. 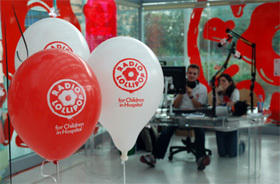 To get your own local Radio Lollipop you just need the support of your local hospital management, a willing core of Volunteers and the ability to raise funds to install a radio station, or receiving equipment to take a satellite feed from a nearby station. We will help you with all the rest.